Would you like to see the dates of the search results on Google? By all means, it’s a useful piece of information. If you narrow a Google search to (any) date range, using the drop-down selection for the date range, the dates are shown. You can then also choose to sort by date if you wanted, to see the most recent results first. When a date range is selected, the Google search URL is changed to reflect this. 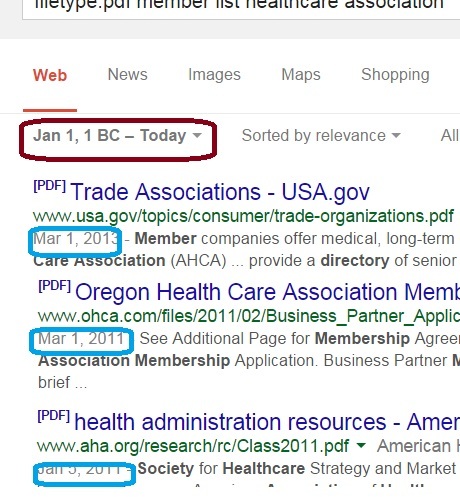 If you use Chrome, you can make Google search to automatically show the dates. In Chrome, set up the default search engine to Google and add the above magical piece of the URL &tbs=cdr:1,cd_min:1/1/0 to it. You can still jump on tomorrow’s Google-Based Sourcing Practice Session to experience this and many other techniques with us interactively. I tried this several times but it didn’t work for me — in Chrome. I even tried changing the & to AND but couldn’t get it to work. Any ideas? It worked for me. Great way to see the dates on google search.